BENTONVILLE, Ark. 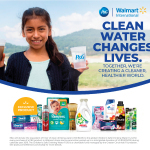 & CINCINNATI--(BUSINESS WIRE)--Walmart International is proud to partner with The Procter & Gamble Company (P&G) and their Children’s Safe Drinking Water Program to launch a 2019 Global Event program that will raise awareness of the global water crisis. Access to clean drinking water is a challenge every day for nearly 844 million people, and the burden for family household water needs disproportionally affects children around the world. In fact, nearly 1,000 children die every day from water-borne diseases—more than HIV/AIDS and malaria combined. Walmart International will support the “1 purchase = 1 liter of clean water” campaign in countries where they have a presence, enabling shoppers to contribute to United Nations Sustainable Development Goal #6 that looks to ensure water and sanitation for all. This global initiative kicked off in South Africa and Japan in February. The next launches will be in Argentina, China and India in March. Mexico, Honduras, Guatemala, El Salvador, Nicaragua, Costa Rica, Chile, Canada and the United Kingdom will participate in the second half of 2019. For every P&G product consumers purchase in the participating countries during the campaign period, P&G will provide one liter of clean water to help children and their families through its Children’s Safe Drinking Water Program. P&G and Walmart International have set a goal to raise 100 million liters of clean water during 2019. “Water scarcity is a significant challenge in many of the markets where we operate. As we continue to do our part to be good stewards of the environment and help people around the world live better, this global partnership with P&G will empower our customers and associates to make a greater impact in our communities,” said JP Suarez, Executive Vice President & Chief Administration Officer, Walmart International. P&G introduced the Children’s Safe Drinking Water Program in 2004, working with NGOs around the world to bring clean drinking water and education on proper sanitation and hygiene. To date, the Children’s Safe Drinking Water Program has delivered more than 14 billion liters of clean water to people in more than 90 countries. Clean drinking water is made possible through the P&G Purifier of Water packets invented by P&G laundry scientists. Ten liters of dirty water can be transformed using just one P&G Purifier of Water packet, a bucket, a spoon and a cloth in 30 minutes. 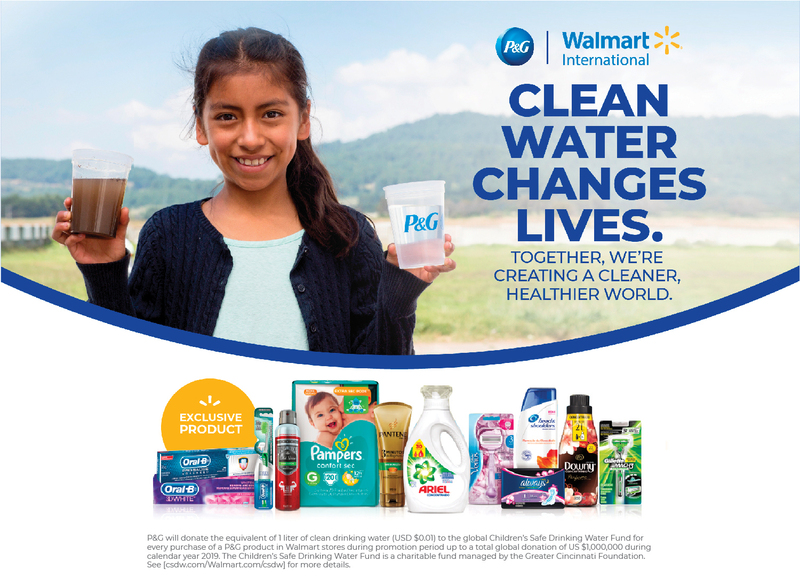 “We are excited to work with Walmart on a global scale to bring awareness to the clean water crisis and expand the P&G Children’s Safe Drinking Water Program that has been transforming lives for nearly 15 years. Growing this partnership will enable us to positively touch and improve more lives and provide clean water that will help enable health, education and economic opportunities,” said Mindy Sherwood, P&G-Walmart Global Vice President. The campaign will run for several weeks in all participating countries. To learn more about the Children’s Safe Drinking Water Program, visit www.csdw.org . Walmart Inc. (NYSE: WMT) helps people around the world save money and live better - anytime and anywhere - in retail stores, online, and through their mobile devices. Each week, over 275 million customers and members visit our more than 11,300 stores under 58 banners in 27 countries and eCommerce websites. With fiscal year 2019 revenue of $514.4 billion, Walmart employs over 2.2 million associates worldwide. Walmart continues to be a leader in sustainability, corporate philanthropy and employment opportunity. Additional information about Walmart can be found by visiting https://corporate.walmart.com/, on Facebook at http://www.facebook.com/walmart and on Twitter at http://twitter.com/walmart.